are a beautiful grouping of emission, absorption, and reflection nebulae at the heart of the Milky Way. I am indebted to Jim Misti and Steve Mazlin for this data. Featuring myriad stars, serpentine belts of dark dust lanes, pink star-birthing hydrogen regions, and blue reflection clouds- could this field be any more stunning? 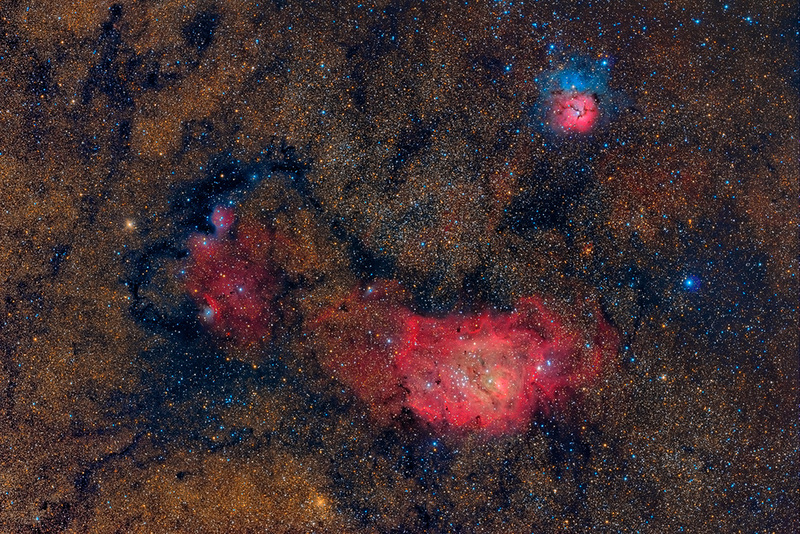 At lower center is M8 The Lagoon, and at 1 o'clock is M20 The Trifid, so called because its pinkish section is divided by the dark lanes into three lobes.